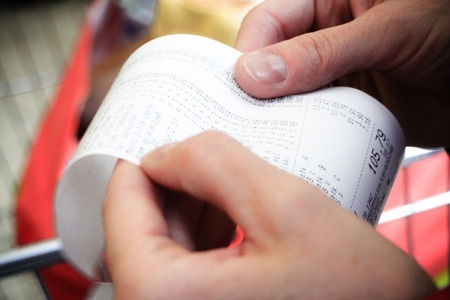 I harp on a bit about how it is vital to know how much your shopping is going to cost before you get to the register and to check your dockets and receipts before you leave the store. Those two points have been reinforced in my mind twice this week as I've been shopping and buying to add to the pantry and our stockpile. I was shopping at Coles and in amongst the items I bought there were three items I'd been overcharged on, and to make it a little more absurd I'd been charged twice, but two different prices for one of those items - so four mistakes, totalling almost $20. I was in a hurry and didn't check the docket until I was at home and trying to work out why my figures didn't add up. I wasn't sure whether to laugh or cry when I figured out what had happened. Laugh because my figures would have been correct without the supermarket's mistakes or cry at my stupidity in not checking before I left the store, because that involved going back, with the goods and the receipt and waiting for it all to be worked out in-store so a refund could be processed. Then yesterday I was shopping in an Aldi store and a discounted item I bought (don't you just love the Aldi discounts?) scanned at full price of $29.95 instead of the discounted price of $5. Kudos to the young man on the register, he picked it up straight away and fixed it immediately, so no loss of money, time or energy there. These two events have had me thinking: if just one item on every second shop was scanned at a higher price, and the customer didn't pick it up, in every store of all three major supermarkets, every day of every year, how much would our mistakes be adding to their profits? Because they all make a profit, and now I'm thinking that lack of diligence by yours truly and other customers is adding to it. So I apologise in advance for holding you up if you are behind me at the checkout in the future, but Wayne and I work far too hard for our money to glibly make an involuntary donation to any supermarket's profits. I choose to keep my money in my purse, and my profits in my bank account. In the future I will be double checking the price of every item I buy as it is scanned and picking up any errors straight away, and I suggest you do the same.